PHANG NGA – Natural Resources and Environment Minister Gen Surasak Kanjanarat has attended a meeting in Phang Nga province on the environmental conservation scheme for the Koh Khai islands. 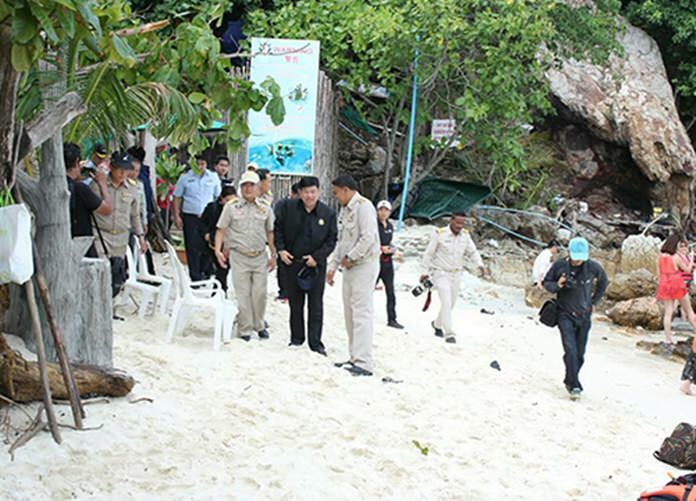 Accompanied by environmental experts and ministerial officials, Gen Surasak called a meeting with the Governor of Phang Nga and local related agencies to consider ways to solve garbage problems on the Koh Khai islands. With 249 rai of coral reefs, the three islands draws large numbers of tourists each year. However, heavy tourist activity can threaten marine and coastal ecosystems. In response, government agencies signed a memorandum of understanding urging islanders to participate in garbage management together with the public sector. Cooperation between the public sector and local residents gave birth to the Koh Khai conservation model. Marine expert Asst. Prof. Thon Thamrongnawasawat praised the villagers for their efforts to revive the islands, as evidenced by the cleaner surroundings and signs prohibiting damage to coral reefs and littering. Gen Surasak affirmed that the Ministry of Natural Resources and Environment must protect nature in a sustainable manner. He disclosed that the governor would appoint a sub-committee to work alongside the coastal and marine resource committee towards the conservation of Koh Khai Nok.